We spent the first part of our honeymoon in Dubai, which was the connection en route to the Maldives – our ultimate and final destination. In truth I hadn’t ever thought of visiting the country – except maybe to Abu Dhabi for the Formula 1 grand prix – and was excited to experience a new culture in travel. It’s an interesting place, Dubai. They are trying so very hard to make it the ultimate tourist destination. If you visit in winter (November – March) and love to shop til you drop, this is the place for you. Dubai is Las Vegas, without the casinos. So if you prefer the more sinful attractions of Las Vegas and could do without the 13 hour flight, hit up the Las Vegas strip. Poor hubby’s sickness got worse in the hot, humid desert heat and he spent our first day at the Atlantis Palm Island in the clinic on a nebulizer. Someone from the wedding was patient zero and got a bunch of us sick. We will find you…. Anyhow, after hitting the ahhh-mazing ESPA, I was ready to have our first real night out on the Honeymoon. Sick or not, I was going to eat well and enjoy it, damnit! As expected, I was not disappointed. First up and our only order beyond the omakase (chef’s choice tasting menu) was the tuna and scallop on miso chip our server recommended. As Anh said, it’s “Tuna on a sour cream and onion chip.” Better than Utz chips though, I assure you. The scallop was my favorite – so velvety and buttery. 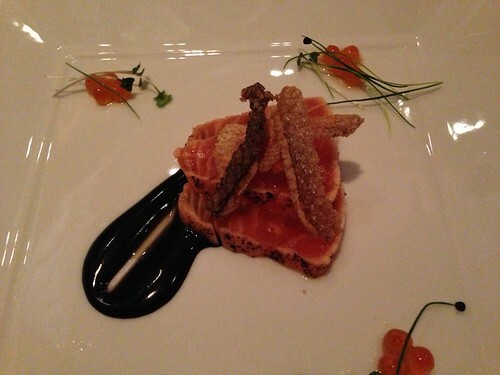 Seared salmon with fried salmon skin and salmon roe and a black ponzu sauce. Let’s be honest – everything is better with fried salmon skin. 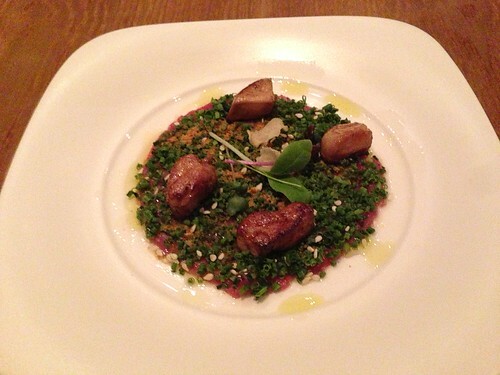 Beef carpaccio tenderloin with herbs and foie gras – micro chives, fruity olive oil and a lovely citrus kick. This was so, so very delicious. The light lemon flavor and fresh herbs were perfect to balance out the rich ingredients. It had a spice flavoring almost like the za’atar seasoning that is served on so many dishes in the Middle East. Side note – I picked up a bag of the seasoning at Union Market in DC and split it with my brother – I can’t wait to sprinkle the herb-y and zesty seasoning on homemade croissants (AKA break open the canister and roll). This photo may look like a small portion, but let me tell you – they did not hold back on serving sizes even though there were serving dishes in the double digits. Anyhow, on to the tasting menu. 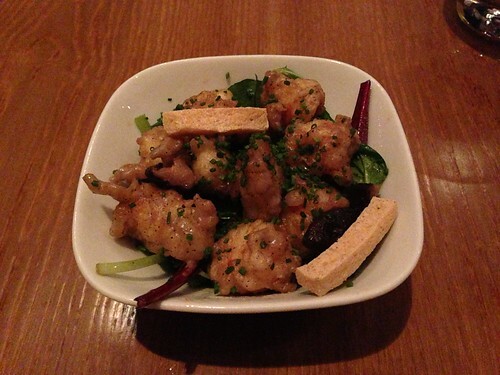 I could not stop eating this shrimp tempura in a citrus truffle sauce with chives, micro greens and dried tofu. I have no words other than I need to learn the art of proper citrus ratios. This was a perfect balance and I may or may not have eaten some of hubby’s. At this point he started to fade – poor guy was a trooper, but this meal was really just for me given his sickness. It was clear from here out that it was a marathon, and not a sprint. 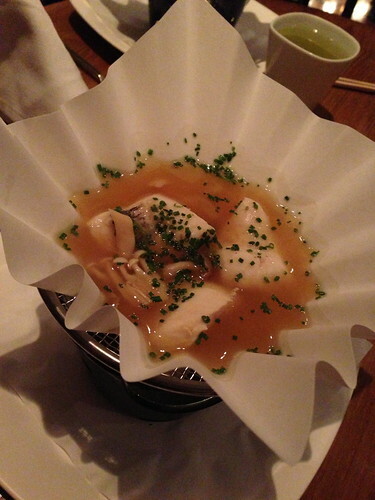 Fish in a….coffee filter. It wasn’t always easy to understand the dish explanation from the corps of international servers over the downtempo house music. Very salty. Not my favorite. The enoki mushrooms were delicious, though. 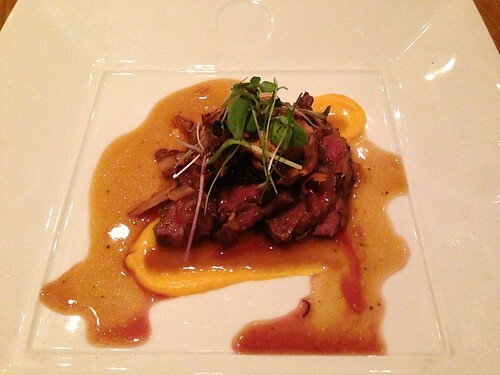 Wagyu (A7) in a sake [something] glaze with a [something] reduction. In addition to the partial description, please also excuse the image quality here – I was trying not to be completely obnoxious when snapping pics of every single dish by leaving off the flash. I’m so considerate. This was Melt. In. Your. Mouth. Decadent. 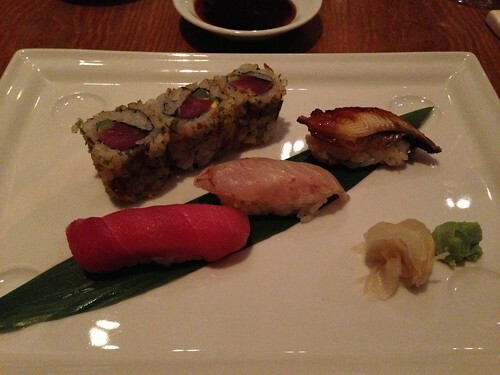 After the Wagyu dish we moved on to the sushi chapter of the evening. They served a plate of Unagi, Marinated Sea Bass (which had a smoked taste) and Tuna nigiri with a few pieces of Tuna and Asparagus with a spicy sauce drizzle, za’atar type spices (I may be making that up, but that’s what it tasted like) and fresh fried onion. Probably the best Unagi I’ve ever had. The sushi was pretty stellar as well, but that was easily trumped once we ate at Reethi Rah’s Tapasake – more on that later. Langoustine miso soup was bisque-like, which you can see from the frothy photo, had a surprising earthy richness from the sesame seeds. 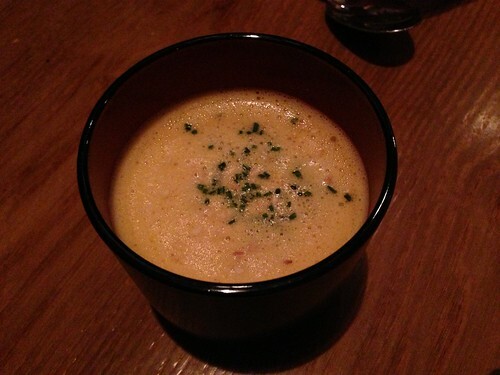 I know it is just a soup, but this was one of my favorites as well. I love it when something so simple is so well executed. If you haven’t tried langoustine, I highly recommend you find somewhere that serves these delectable crustaceans. They’re like a cross between a lobster and shrimp that have the best qualities of each. Tasty little bottom feeders. 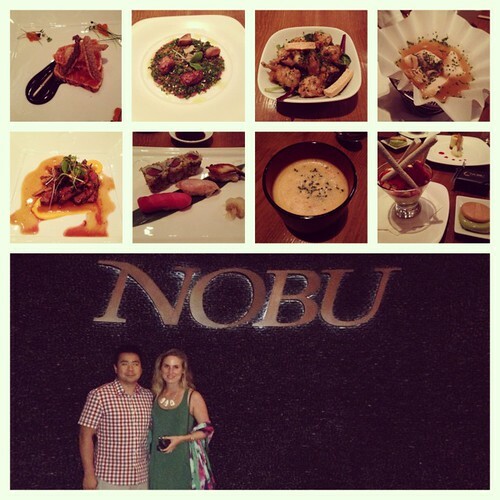 This concluded the main courses of our gluttonous omakase feast, but the experience was far from over. The final dessert course was actually a four-part affair. We could have easily shared one serving of each, but they didn’t seem overly concerned about our food waste. 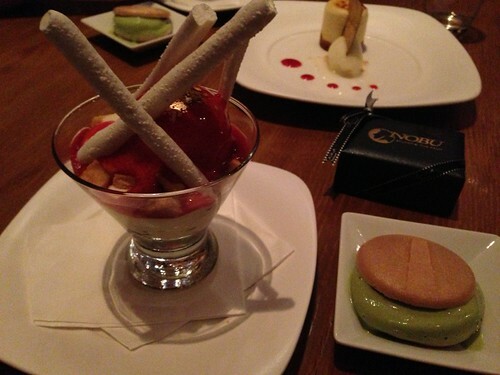 The omakase dessert brought Yuzu strawberry sorbet merengue with shortbread and hardened merengue sticks, and a Japanese Macaron of green tea ice cream and chocolate shell. The cookie part tasted like a McDonald’s cake cone, and that’s not meant to be an insult! It was the size of a baseball and melted fast, so we only had a bit of the macaron. The merengue was amazing – the perfect end to a rich and filling tasting menu. 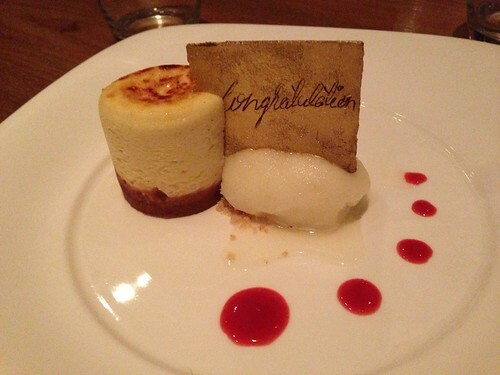 Nobu signature cheesecake and super citrusy sorbet. Amazingly light and a great combination of flavors – I wouldn’t normally think of pairing cheesecake with citrus. So that was our first nice dinner out as husband and wife, and it was all that I could have hoped for. 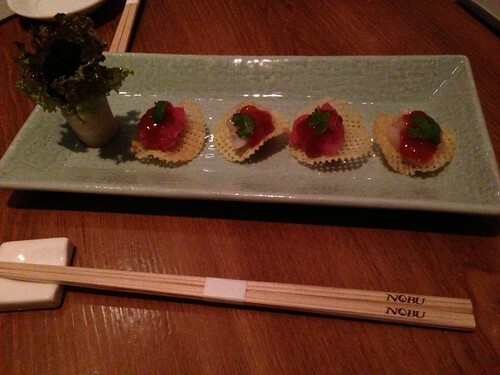 Nobu stood up to the hype! You know, minus the debilitating illness of my husband…but that got better.